Concrete work requires specialized tools for pouring, mixing, cutting and shaping concrete, just like a skilled worker needs the right set of tools to effectively perform his job. We are not referring to the big, bulky and noisy ones usually employed at construction sites, but are talking about the small, efficient and portable ones, usually used by commercial concrete contractors for small-scale concrete-based repair works. 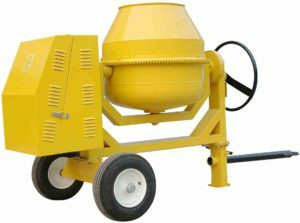 Do keep in mind that portable cement mixers have much smaller capacities, so it is necessary that contractors have an accurate estimate on how much concrete is required. 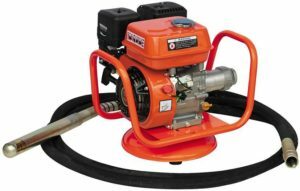 Concrete vibrators are an absolute necessity to ensure that the concrete is properly and densely packed after it has been poured/applied onto a surface. Concrete vibrators eliminate air pockets and help in improving consolidation of the concrete mixture. Better consolidation results in better cure, and ultimately better durability. Concrete saws are starkly different from the ones used to saw wood. They are portable, heavy and have a high-speed rotating blade that is powered by an electric motor affixed to the saw. 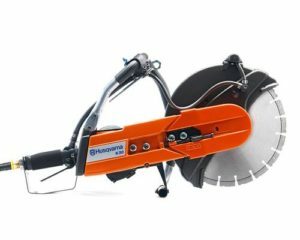 The fast-spinning blade gives inch-perfect cuts and are generally used for making contraction joints in concrete slabs. Some variants come in the form of chainsaws that are used for aggressive cutting tasks. Big and heavy walk-behind concrete saws are also available for cutting huge blocks of concrete in one go. A screed is one of the least expensive tools one can buy. 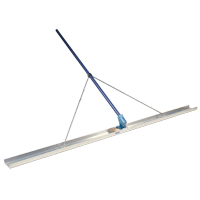 They are long, thin bars of wood or plastic, with a long handle on the top and are used to apply and spread wet concrete on large surfaces and remove excess concrete off them. Floats and screeds serve similar purposes, but they differ in size. 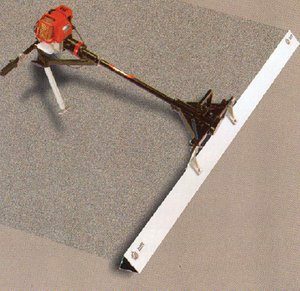 Floats, being smaller in size than screeds are used to smoothen out wet concrete on a small surface.